Start the year as you mean to go on and have some creative fun making a four seasons calendar. 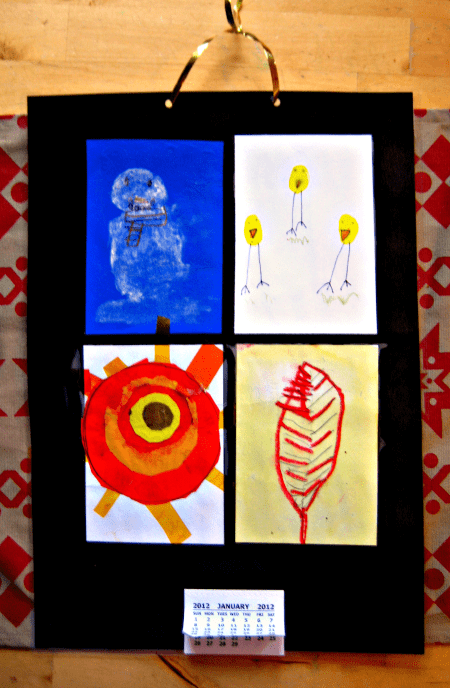 It’s a great way to try out four completely different art techniques with your children and welcome in the new year. L’s calendar is made from four pictures depicting the seasons, each using a different art technique. 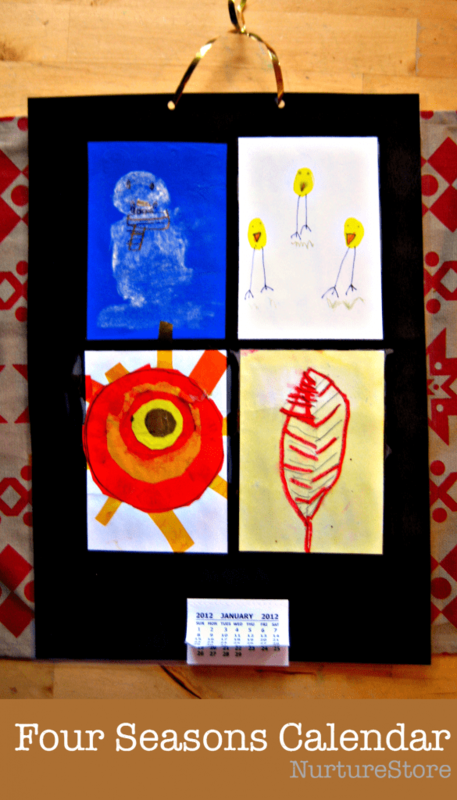 To make the calendar you will need four rectangles of card and one lard piece of card to be the frame. I hope L’s pictures will give some ideas but I’d suggest you chat with your child and decide what they think would make a great picture for each season, and then see how they would like to create their calendar. I find with my kids that sometimes they have an idea straight away that they want to put into action and sometimes it’s a rummage through our craft supplies and the discovery of a new material that sparks an idea. And remember that all sorts of things can be art materials, not just paint and crayons – cotton wool, sweet wrappers, left over wrapping paper and drinking straws have been favourites for us this week. 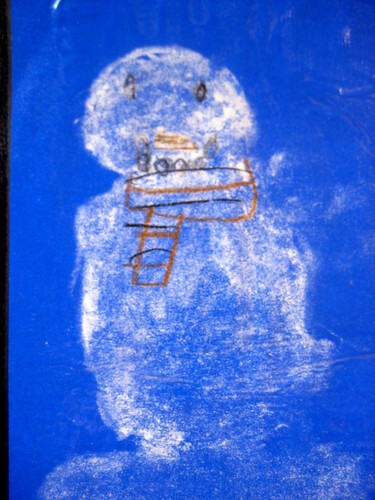 Here’s L’s winter icon: a snowman made using white chalk on a blue background, with added embellishments in pencil crayon. 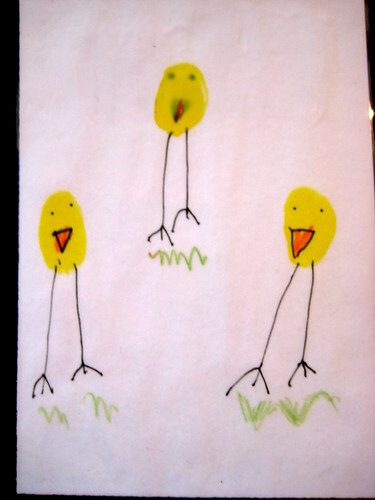 Here’s spring: little fingerprint chicks with faces and legs added in felt pen. 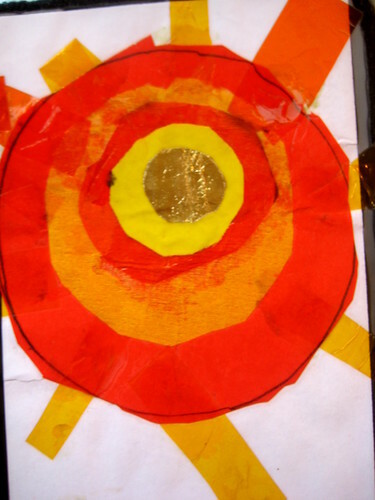 Here’s summer: a glorious sun, made from a tissue paper and gold foil collage. 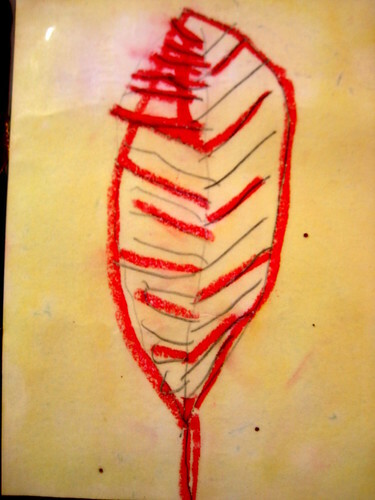 Here’s autumn: a simple left drawn in pencil and wax crayon. Click here to get your copy of the Seasons School Winter Retreat 21 day activity program. It's one part educational curriculum; one part seasonal celebration; one part family memory making. Click here to get your guide. This is great! We just started talking about the Four Seasons today by reading Bill Martin Jr.’s The Turning of the Year. This is so simple, yet such a great learning activity! I love it!!! What a very lovely calendar! Adorable! loved the pix and made me think of something somewhat related. My son has a framed photo of a tree in the Washington D. C. area, photographed in all 4 seasons! It’s incredible and really, couldn’t we all find something intriguing and do the same thing?!! Can you use this in January! The winter kit? Is there a sample somewhere to look at? Hi Kristen. The Winter Retreat is perfect for January. I love to do it them with my children. You can see more details about it here.